In the first half, each team managed only a field goal early. The biggest play came from a 50-yard WR A.J. Green reception, that is until QB Deshaun Watson ran for an impressive touchdown. The Bengals would respond with a second field goal to keep it close at half time. In the second half, each team added a field goal and the Texans came away with the 13-9 victory. With that, we give you our PFF exclusive takeaways from the contest for each team. Thursday night was a far better performance than Watson’s Week 1 outing, but it was still a mixed bag overall. He had the long scramble for the game’s only touchdown, which was easily the play of the game. However, he also threw a pass in the first quarter that could have, and maybe should have, been intercepted by Darqueze Dennard with the potential for it to be returned for a touchdown, which would have made it a completely different game. Watson also completed just two passes that were targeted 10-plus yards downfield on six attempts. The Texans’ offensive line was pretty poor as a run-blocking unit overall, and their extra offensive linemen sets didn’t add much in place of their typical tight ends. Both running backs had little to work with but got as much as they could given the circumstances. Foreman had a couple nice runs, broke two tackles, and gained 32 of his 40 rushing yards after contact. Football is more fun when J.J. Watt is on the field and healthy and playing the way we’re all used to seeing him play. We got that tonight. The future hall-of-famer totaled six pressures on the night (all hurries) to go with two stops and a great 88.7 run defense grade. Watt’s first step was unstoppable tonight, as he often found himself by Cincinnati offensive linemen before they were even fully up out of their stance. Watt is now up to eight total pressures on the season to go with an elite 90.7 run defense grade through two games. Cunningham followed up a nice professional debut last week with an even better game this week, earning good grades in both run defense (83.9) and coverage (81.6). The second-round pick out of Vanderbilt tied for the team lead with five tackles and three of those were stops (a tackle that constitutes as a loss for the offense based on down and distance) and he was targeted just twice on the 27 snaps he dropped into coverage on. A decisively average performance from the Bengals veteran quarterback. The Bengals had a fairly conservative game plan on offense Thursday night and with the exception of a handful of deep balls, Dalton wasn’t asked to push the envelope. He finished the game with a 76.4 passer rating but when you only look at his accurate, aimed passes (he threw the ball away five times and had another pass batted down at the line of scrimmage and had another one dropped) his adjusted completion percentage was 72.4. While it certainly wasn’t a breakout game for the rookie out of Oklahoma, Mixon did earn a higher overall grade than his backfield peers, Jeremy Hill (73.3) and Giovani Bernard (50.3). Mixon earned 26 of his 36 yards after contact, while his 4.0 yards per carry was at least a whole yard greater than both Hill (2.8) and Bernard’s (2.0) averages. Mixon showed good patience, allowing holes to open up on zone runs and he showed good burst to the outside when he needed to beat someone to the edge. 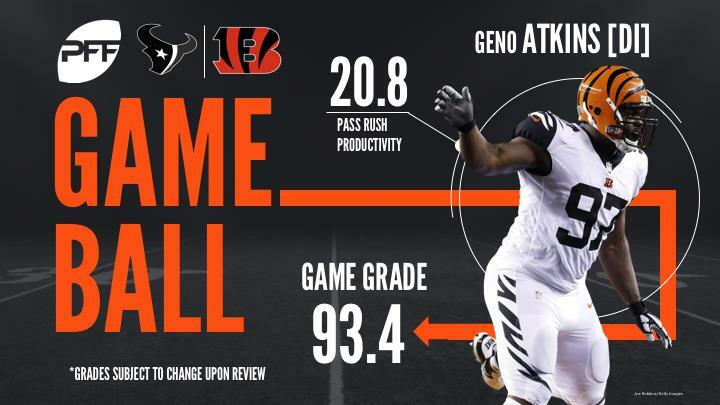 The Bengals ended up with the loss, but overall the defense allowed just 13 points largely due to the outstanding play of Geno Atkins. Atkins had six total pressures on the night, including two sacks, and one more quick hurry that was nullified by DeAndre Hopkins‘ offensive pass interference penalty. He had only one run stop himself, but that doesn’t diminish his impact. Atkins was fairly disruptive as a run defender too, often forcing Houston’s running backs away from the intended point of attack and creating easy clean up stops for his teammates. Willis saw a big increase of playing time with starter Michael Johnson out, and his production improved with the opportunity. He had a one pressure and beat LT Chris Clark two other times as a pass-rusher, while making two stops in run defense and getting in on four other tackles. He may not has been as productive as a pass-rusher as Johnson could have been, but it was still a nice outing by the third-round rookie nonetheless.